Redemption. There is nothing quite like it in the world of sports. One year ago, then No. 1 seed Virginia men’s basketball lost to the No. 16 seeded UMBC Retrievers in the opening round of the 2018 NCAA tournament, the first time ever that a No. 16 seed beat a top seed. This year, Virginia casts those demons aside as they stand atop the world of college basketball as Division 1 National Champions. They defeated Texas Tech 85-77 with a hard fought overtime win Monday night. Virginia’s path to the national championship was by no means an easy one. In a game on March 22nd that created flashbacks to last year’s opening round defeat, top-seed Virginia trailed No. 16 seeded Gardner-Webb by up to fourteen in the first half of their first game and were down 30-36 at the half. However, they were able to come back and win convincingly 71-56 with their defense, the best in the country by points against. After a more comfortable 63-51 win over Oklahoma in the second round, they had to take on Oregon in the Sweet Sixteenwhere they squeaked out a 53-49 win. The Elite Eight matchup was perhaps the game of the tournament up until that point, as Virginia took on Purdue. In spite of 42 points from Purdue star, Carsen Edwards, Virginia was able to pull out the overtime win 80-75 behind 25 points and a couple clutch free throws from shooting guard Kyle Guy. Guy similarly came up big in the Final Four win over Auburn. Auburn was up by two points with 1.5 seconds remaining when Virginia’s Ty Jerome committed a double dribble that went uncalled, which would have given Auburn possession and almost certainly victory. He was then fouled by Auburn. Guy received the inbounds pass and immediately put up a desperation three-pointer with 0.6 seconds remaining. However, after a controversial foul from Auburn’s Samir Doughty, Guy made all three free throws to give Virginia the win. Virginia, for the third or fourth time this tournament, was able to escape a brush with elimination. Texas Tech took a somewhat smoother path to the Final Four. They won their first three games by a combined 54 points with their smallest margin of victory being fifteen in the first round against Northern Kentucky. Their first real test came against No. 1 seed Gonzaga in the Elite Eight. With Texas Tech up by two, a Gonzaga player was assessed a rarely called technical foul for reaching over the out-of-bounds line while defending an inbounds pass, which led to two free throws for Texas Tech, both of which they made. Only seconds later, there was a missed call when a Texas Tech player was ruled to have saved a ball from going out even though he had stepped out of bounds before touching the ball. Texas Tech was able to squeak out a 75-69 victory that was even closer than the scoreline indicated. Future NBA lottery pick Jarrett Culver helped lead the way with nineteen points, and he averaged over 21 points per game through the first four rounds of the tournament. The Red Raiders then faced a tough Michigan State in the national semifinal but ultimately overcame them 61-51 in spite of a down shooting night from Culver in which he went only 3-12 from the field. This set a showdown in the National championship game between two of the best defensive and slowest paced offensive teams in the country. Many expected scoring to be at a premium in this game, and that certainly was the case for much of the first half. Five minutes into the game, Texas Tech was leading only 3-2. It took them over seven minutes to record their first field goal against the nation’s best defense. After that, the offense started to open up for each team, and Virginia led 32-29 at the half. After the break, both teams continued to trade blows, but Virginia was eventually able to string a run together that put them up by ten with just over ten minutes left to play. In spite of the big lead for Virginia, Texas Tech was never out of the game. An And-1 bucket for Tech’s Norense Odiase, with 3:28 remaining, knotted the score back up at 59. The teams would continue to trade shots down the stretch, and Texas Tech found themselves leading by three with twenty seconds remaining. However, Virginia star De’Andre Hunter, who had gone the first eighteen minutes of the game without a basket, hit a huge three-pointer with twelve seconds remaining to tie the score. Jarrett Culver got stuffed at the other end on a last second shot, and the game was headed to overtime with the teams tied at 68. For the second weekend in a row, Virginia would have to soldier though five extra minutes of basketball if they wanted a win. Texas Tech led 73-70 with three minutes remaining in overtime, but Virginia began to work their way back into it. First Kyle Guy hit two free throws, and then another De’Andre Hunter three-pointer gave the Cavaliers a 75-73 lead, one they would not relinquish for the rest of the game. A crucial possession call gave Virginia the ball back after a ball was poked away from Texas Tech’s Davide Moretti and was ruled to have last brushed his pinkie. 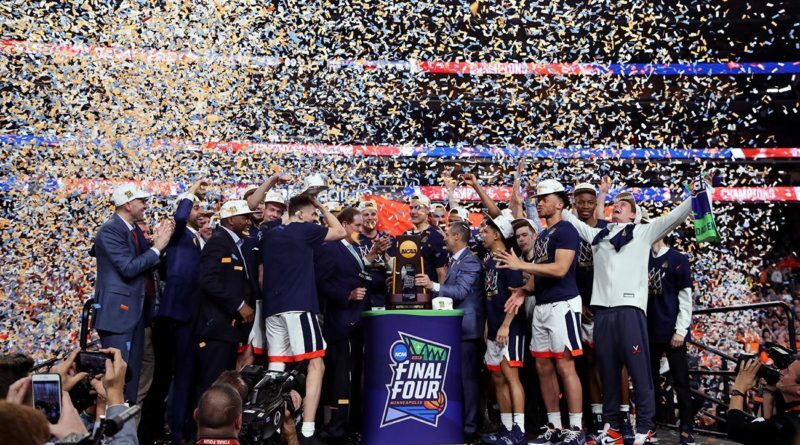 Six consecutive free throws for Virginia would push their lead to eight, and that was the final margin of victory as Virginia walked away as national champions with an 85-77 victory. They were once again able to survive overtime, and this time around the reward was a championship. Only one year removed from losing to a No. 16 seed for the first time in tournament history, Virginia was basketball royalty.